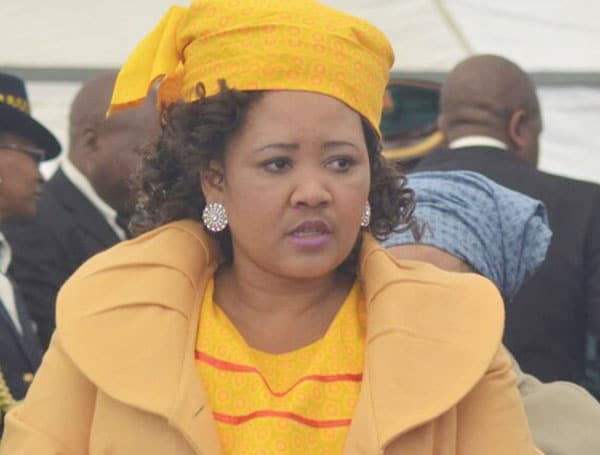 MASERU – A former bodyguard to Prime Minister Thomas Thabane, Kopano Kopanye, says First Lady ’Maesaiah Thabane has fanned the civil war tearing the ruling All Basotho Convention (ABC) apart and ignited fears of possible government collapse. Kopanye, who protected Thabane when he was still in opposition, said if it were not for ’Maesaiah’s interference in the running of the state and ABC affairs, both the party and government would be stable. But a fuming ’Maesaiah yesterday dismissed Kopanye’s allegations as “rubbish”, further ordering this journalist to “never again call me to ask me about that rubbish”. “Do not ever call me to ask about that rubbish, do you understand? (U se ke be oa hlola u ntetsetsa u tlo mpotsa ka rubbish eo oa utloa)? quipped ’Maesaiah, sounding irritated over the phone. Kopanye, alongside Senator Kemiso Mosenene, Justice Sizwe Lenkoane and Thabo Thants’i, was part of Thabane’s security detail since 2007 following that year’s election. The squad stepped in to fill the void created by departure of his initial security detail into exile after being accused by Lesotho’s security services of allegedly terrorising former Prime Minister Pakalitha Mosisili’s government. But now with relations having gone awry, Kopanye has finally opened up about the strife in the ABC, which he alleges led to his expulsion from the party. When Thabane assumed power for the second time in 2017 and became Lesotho’s premier whose security was now the responsibility of the army, an arrangement was made at party level, to farm out his bodyguards to cabinet ministers who are members of the ABC. This is how Kopanye ended up guarding former Minister of Law Lebohang Hlaele who is also Thabane’s son-in-law. Hlaele was fired from his coveted job in February, just two weeks after he was elected the ruling party’s secretary-general at a disputed elective conference on the weekend of February 1 and 2. He was fired along with former Minister of Social Development ’Matebatso Doti, for supporting a faction of the ABC that sided with Deputy Leader, Professor Nqosa Mahao. Kopanye was deemed collateral and lost his job as a result. Two ABC factions are currently locking horns in the High Court, after three members who also contested the NEC elections challenged the outcome of the polls that saw National University of Lesotho (NUL) Professor Mahao and Hlaele clinching the posts of deputy leader and secretary-general respectively. Some prominent members of Mahao’s camp who also won positions in the NEC are Chairperson Tsuinyane Rapapa, Publicity Secretary Montoeli Masoetsa and his deputy Doti. The brouhaha in the ABC has led to the old NEC and the new jostling for control of the ABC by holding different rallies at different places at the same time. However, Kopanye yesterday told Public Eye that the infighting in the ABC took a turn for the worse well ahead of the party’s elective conference, and that his woes began when he was summoned to the State House supposedly by his leader Thabane. But he alleges he was surprised when he arrived there to find ’Maesaiah chairing the meeting. Kopanye claims that because he arrived well after the meeting had started, that made the First Lady focus on him and further alleges that immediately after he arrived, she confronted him, saying she had learnt he was now the bodyguard to ABC Deputy Leader Mahao. “I told her that was not the case and that I had only been seen in his company because my boss Mr Hlaele appeared on the nomination list that supported Prof. Mahao’s candidature. “I told her, as a result it was inevitable that I would be seen with Mahao’s people,” Kopanye alleges. He further claims that throughout the meeting Thabane maintained silence while ’Maesaiah took the lead. He says following his response, she told him and the other bodyguards and drivers in the meeting that she would fire the ministers who were their bosses “so that you will starve to death”. “That is how I knew that my boss Ntate Hlaele would be fired. I knew before he did that he would be fired,” Kopanye alleges. So intense is Kopanye’s loyalty to Hlaele and the new NEC that he and six of his colleagues who have also fallen out with the State House continue to provide security not only to the former minister but the rest of the NEC members. A defiant Kopanye has argued that Mahao’s group was the bona fide ABC NEC and they would protect them until the new NEC has reclaimed its rightful position in the party. “We know that our lives and the lives of those we are protecting are in danger. We know that there are plans to eliminate us all. “That is why my six other colleagues and I are determined to protect them. We have sworn that whoever wants to kill them would have to go through us first to get to them,” Kopanye says. Kopanye further notes that if the First Lady ceased interfering in the running of government, “we would all be better off”. “ABC would be better off without her interference. She should just leave the running of the party and state affairs alone. We love the ABC leader very much and are aware that the First Lady is abusing his powers to get her way,” Kopanye alleges. Kopanye said what hurt them deeply was the fact that for a decade they were by Thabane’s side, providing him with top-notch security from which the First Lady benefitted even when he was in opposition. Kopanye said they had abandoned their families and accompanied Thabane when he fled to exile in South Africa, where he spent almost two years before he returned to Lesotho in February 2017, just so he would be safe. “We provided him and the First Lady with security throughout the most difficult times when our lives were in danger as we were being pursued by state agents. “But today we have become outcasts while some of our colleagues benefit from the State House. Political Scientist Dr Fako Likoti told Public Eye last night that while the First Lady was interfering in the running of the state and ABC affairs, she was merely a product of an anarchic situation created by her husband. “The First Lady is only a by-product of an anarchic situation created by Thabane. She has no role in government and has absolutely no institutional background to be ordering people around and firing them,” Likoti said. Likoti said he blamed Thabane for plunging Lesotho into the anarchic situation which he said was threatening the country’s stability and security, adding “Thabane’s vigilantes as they take one each other” pose a threat to national security. “This means that ABC is imploding. We are at the beginning of anarchy. Thabane used to say there was lawlessness in Lesotho when he was in the opposition. But now he’s the one promoting vigilantism,” Likoti said. “Thabane is a danger to Lesotho’s security. Lesotho is now in an anarchic situation.